(Nanowerk News) Skyrmions are stable nanoscale magnetic whirls that are emerging as promising candidates for memory and data storage devices, although difficulties in finding practical ways of controlling them have hampered progress. 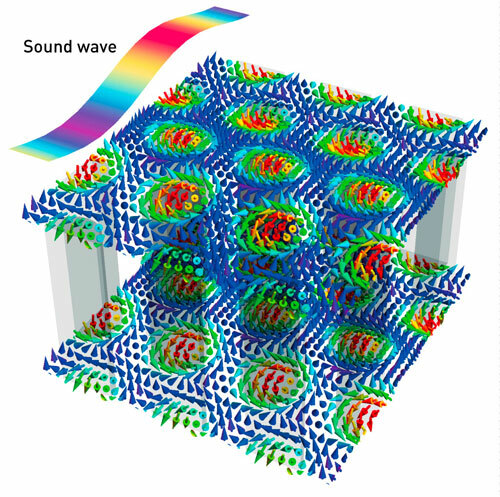 RIKEN researchers have now discovered that sound waves can be used to both measure the elasticity of skyrmions and drive their oscillation mechanically ("Elastic Stiffness of a Skyrmion Crystal"). Magnetic data storage is achieved by imprinting magnetic information into a storage medium. The ‘up’ or ‘down’ direction of the magnetic orientation or ‘moment’ in the medium represents the digital information that is stored. However, as the storage density of computer hard drives increases, the physical size of the area used to store this information becomes smaller and the magnetic moments can easily misalign due to thermal fluctuations. Skyrmions are a promising alternative to solve such issues. In a skyrmion, the magnetic moments do not point in a particular direction but instead form small whirls (Fig. 1) that are particularly stable due to their complex structure. This stability allows skyrmions to be placed much closer to each other than is possible using normal polarized magnetic domains, resulting in a higher density of information storage. As only a few materials are known to form skyrmions, and then only under specific conditions, many of the properties of these unusual magnetic features remain unexplored. Noting that the underlying crystal structure of the material allows skyrmions to form, Yoichi Nii and colleagues from the RIKEN Center for Emergent Matter Science examined whether ultrasonic sound waves could be used to probe some of the mechanical properties of these magnetic whirls. By applying a sound wave with a frequency of 18 megahertz, the researchers were able to measure the elastic stiffness of the skyrmions from the tiny distortions across the crystal induced by ultrasonic energy. The minute signature of the skyrmions was detectable at certain resonances, although the much larger response from the crystal atoms made this challenging. “As skyrmions are extremely ‘soft’, we have to measure the relative change precisely with an accuracy of one part in a million,” explains Nii.